We got a lot of snow last winter. We get a lot of snow every winter, in fact. But, last year was exceptional. If I remember correctly, we had over 80 inches of total snowfall. Most of it blows around and drifts, so it isn’t all piled up, but, it was still a lot of snow. And, a lot of snow is heavy. The deck on our house was built before we bought the house, so it was probably 10 years old, or older. Late one evening, just before spring, we heard a loud cracking noise come from outside. I went outside to see if I could find the where the sound came from, hoping it wasn’t a big tree branch (or a whole tree for that matter), to find that part of the deck had sunk about 3 inches below where it was before. It doesn’t take a construction genius to figure out that that is a bad thing. With snow on the deck, it was hard to diagnose exactly what the issue was, so we waited until spring had come and the thaw had gone. I pulled the first board off of the deck, and found that the sill plate (the board that attaches to the house and supported an entire side of the deck) had given way. The weight of the snow, combined with the age of the deck and mother nature’s toll on the materials had caused it to break apart in several places. It wasn’t really safe to use anymore, so we decided to replace the board and all of the decking, leaving the support posts and railing. We were hoping that by leaving the support posts and railing, we’d save some money on the project. And, that would have likely been true. 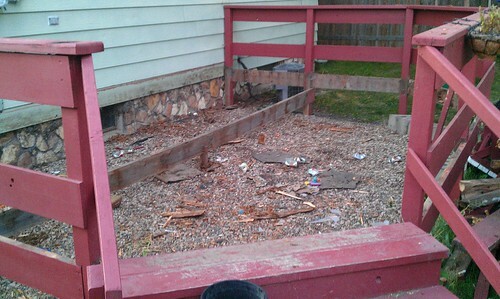 After I had removed all the decking, here’s what we were left with. With it torn down to this degree, we were ready to do a little clean up, and start on replacing the decking. So, I got my hammer, and started pulling nails out of the posts and railing. One of the first nails I attempted to pull was a stubborn one. Instead of coming out of the wood, the entire post it was in came up off the ground by about 5 inches. Oh, boy. I went around and tested a few of the other posts, and sure enough, almost all of them were rotted through at the ground level. My affordable deck repair had suddenly become a not-as-affordable deck replacement. When it was just a deck repair, we had planned on spending about $700 on materials to fix the deck. When it was all said and done, we spent over $1200 to replace the deck. Now, had we had a contractor come and do the work, it would have easily cost us twice that, so I won’t complain too much about the cost. But, when you’re expecting one price, and then end up spending twice that price, it’s a bit of a shock to the system. At the time, we had the money, so it wasn’t that big of a deal. Shortly after we started the deck project, we decided to sell the house, so it was going to be a big bonus for selling the house. Instead of the old rickety deck, we’d have a nice new deck as a selling point. (P.S. attempting to build a new deck while also trying to prepare your house for sale is not the best idea. Just saying. ) Then, I quit my job. And we took the house off the market. So, we get to use the deck ourselves. Of course, we could use the money we spent on the deck, now, but there’s nothing we can do about that. I didn’t keep track of exactly how long it took, but overall, I think it came in at about 4 weeks of nearly every night after work and weekend work to get it finished. When it was all said and done, this is what we ended up with. 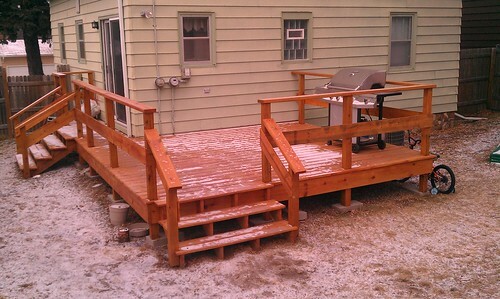 Note: I realized when planning this post that I hadn’t taken a picture of the finished deck, so I took one, last week. I think it turned out really well. It’s way more solid feeling than the old deck, and since we redid the whole thing, we got to stain it, rather than paint it that “fun” redwood color that the old deck was. One of the key takeaways here is that while DIY can often save you money, the projects that you take on can sometimes be more way more than you intended to do. Had we hired a professional to do the work, it would have likely cost us way more. Replacing the decking is a pretty easy task that most DIY’ers should be able to tackle, but building an entire deck is a bit more complicated. Several times, I found myself scratching my head, trying to figure out what step I needed to do next. And, I’ve built a deck before! Someone with less experience and know-how might have easily found themselves in a pickle and had to hire a contractor to come in and finish up. It could easily turn into a DIY disaster that costs way more than anticipated. And, if you’ve only got so much budget to go around, like most of us do, even a little bit more can put a crunch on your finances. Be sure you do as much analysis as you can on the project, and budget for unforeseen issues, before you tackle any major DIY project. Also, it’s better to have it done right, than have it done cheaply, so if you get in over your head, find a professional to help you. Many will gladly charge a consulting fee to come and tell you what you need to do next. Find one that will, or hire one to finish the job so that it’s done right. What have your DIY disasters been? Massive budget overages? Stuff you built fall apart? Share with us!